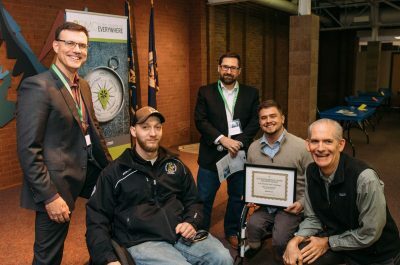 Destination Medical Center’s first-ever pitch competition, the Assistive Tech Challenge, took place on Saturday, November 3, 2018 as part of the Assistive Technology Expo at the Rochester Community and Technical College Heintz Center. Presented by Destination Medical Center’s Discovery Square in collaboration with The Arc Minnesota Southeast Region and the disABILITY Mayo Clinic Employee Resource Group, the Assistive Tech Challenge aims to alleviate barriers to employment, better enable social communication, and improve access to public infrastructure for those living with disabilities. Six teams pitched in the Open Division (community and students). Seven teams pitched in the Professional Division (businesses with an annual revenue not exceeding $250,000). Adapt-a-Cart, developed by Rochester residents Cody Schmidt and Nicholas Elliott placed first in the Open Division. These men, who met while playing sled hockey, both experience extreme frustration while grocery shopping. Adapt-A-Cart provides an adaption on grocery carts for the wheelchair user that is light, compact, and easy to use, allowing wheelchair users the opportunity to easily shop with the standard cart with their own chair. AbleKitchen, led by Samantha Grover of Minneapolis, finished in second place in the Open Division. Fueled by a desire to cook with her intellectually disabled sister, Grover is developing an all-in-one recipe, meal planning, and shopping application to make cooking easier. This product is not just for people with disabilities but is a solution for able-bodied people as well. The AbleKitchen app includes a step-by-step breakdown of recipes in an easy-to-follow manner, including audio and visual cues and kitchen safety tips, aiming to include information that is left out of traditional recipes. Minnesota business Vitals Aware Services took first place in the Professional Division. This Minneapolis startup is a tech company created to do social good. 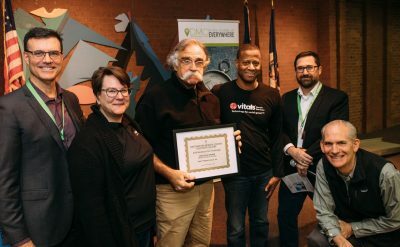 Vitals Aware Services aims to better facilitate interactions between law enforcement, caregivers, and individuals with invisible and visible disabilities. The company’s technology facilitates information exchange between first responders and those suffering from mental illness. Vitals Aware Services has two mobile applications: one for law enforcement and one for caregivers and individuals. The emerging Minneapolis business Mobility 4 All landed second place in the Professional Division. 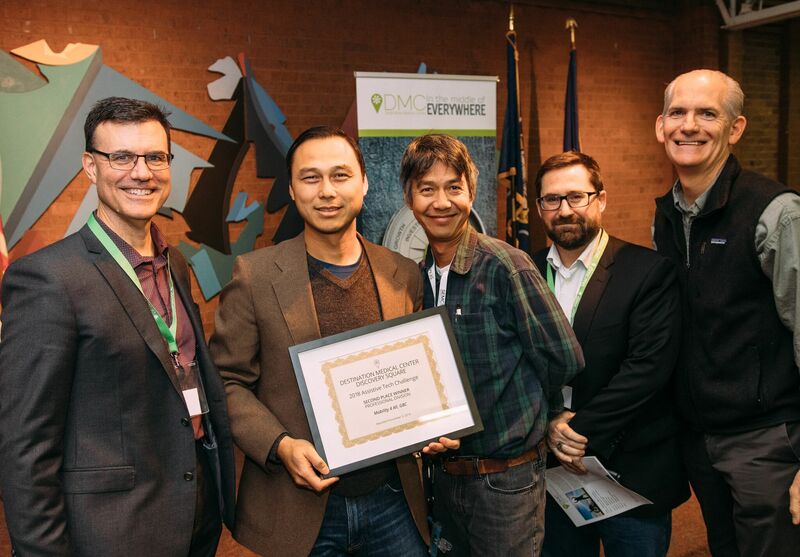 Led by CEO John Doan, Mobility 4 All aims to be “the kinder, gentler ride service for seniors and people with disabilities.” The company matches riders with reliable door-to-door transportation service with fully vetted and trained drivers, providing a “trusted family ride without the guilt trip.” Mobility 4 All launched a pilot service in February 2018, using a simple payment processing system of “MO Points” as currency. “The spirit of innovation we saw at the Assistive Tech Challenge is native to Rochester and our region, and Discovery Square is the perfect place to turn those ideas into world-changing products,” noted Chris Schad, director of business development for DMC’s Discovery Square. First place teams in the Open and Professional divisions were awarded $5,000 by The Arc Minnesota. Second place teams received $2,500 from the Arc Minnesota. 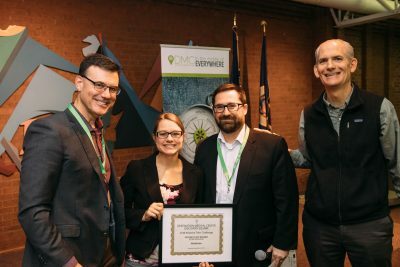 All first and second place teams are eligible to participate in the Walleye Tank pitch competition in Rochester, MN on December 7, 2018. Thirteen teams came from the Rochester area, the Twin Cities and nationally from Naples, Florida. University teams participating included: University of Minnesota, Minnesota State University Mankato and the University of Wisconsin-Eau Claire. Special thanks to Fredrikson and Byron, P.A. and Home Federal for their support of the Assistive Tech Challenge.